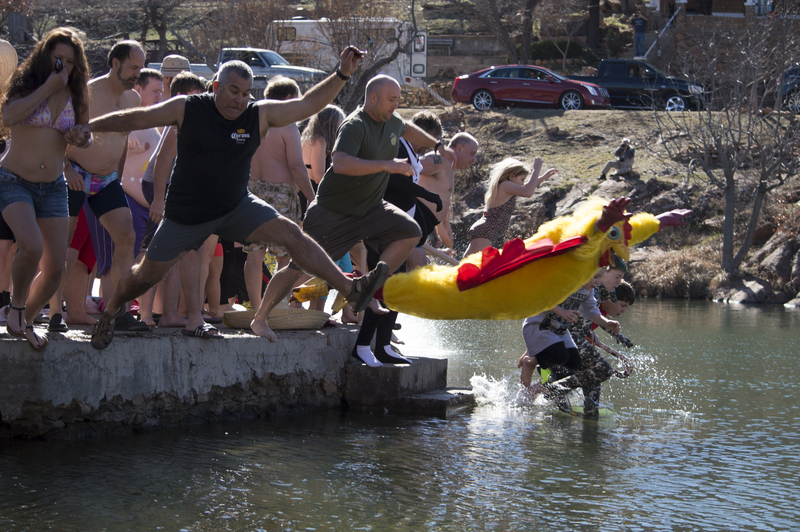 At 2 p.m. on Feb. 7, hundreds of people flooded the water and shores of Medicine Park Creek for the18th annual Polar Bear Plunge. Although the air temperature was a balmy 70 degrees, the water was still 35-40 degrees. 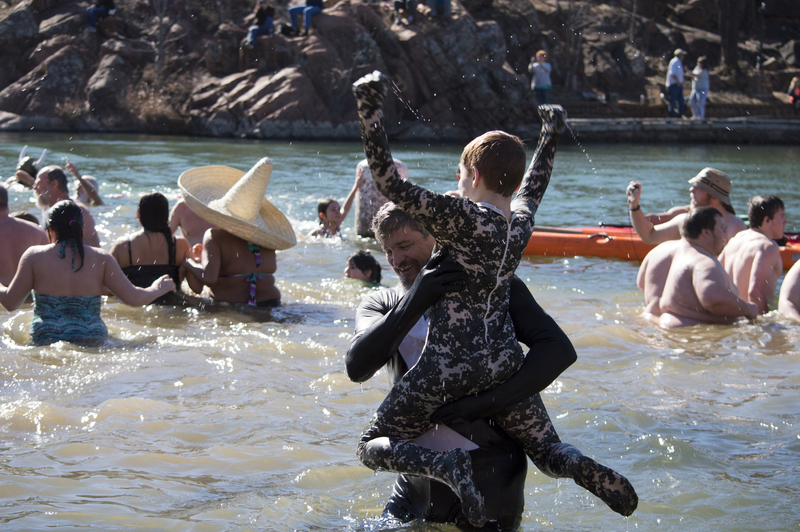 Some jumpers brought more than their bathing suits to jump into the frosty-cold lake. One jumper donned a Viking-style helmet, while another sported a chicken costume. They weren’t the only special jumpers though – Santa was there, too. Charley Wright, who wore the famous red Santa suit, said he is one of the original few who started the tradition years ago and has jumped every year since. What began as small tradition among several friends, including the park’s tavern owner, Bill Patty, turned into a lasting tradition and organized community event. Wright said it wasn’t just tomfoolery that sparked the tradition – it was a plan to bring people into the town, especially during a flat time of year. Although Wright is not the only interesting character to participate in the plunge, he is still uniquely set apart. David Anderson is the person who plunged donning the Viking helmet. Anderson, who has attended the past four years, said this year was the warmest, and he continues to dive into the cold because it’s fun. The person who sported the chicken suit, Zach Johnson, is a Medicine Park locale who said he participates in the plunge because it starts the year off right. According to Johnson, the warm air temperature might have fooled some people. With the tradition of the Polar Bear Plunge growing in Medicine Park, Wright said he believes it would be in the best interest of plunge attendees to be more cautious. Even though he recalled only one injury in the history of the event, he said he is always concerned about jumper safety, as well as the time people spend in the cold water. Since the more people attend the event, some people must now jump off the platform in waves. “I’m worried about a big person jumping on a little person,” Wright said. However, he is still grateful that people come out during wintertime to enjoy the plunge – and he is happy to dress as Santa. CUTV Highlights: Flashmobs, Grocery Bingo and more!